A special hour-long news analysis and talk show with a live studio audience hosted by Jason Houk with Mark Kellenbech and Wes Brain. This video program also presents the 27 minute version of “The Healthcare Movie” followed by questions from the studio audience. If you have doubts and questions about single-payer, universal healthcare, this comprehensive, fact-filled show will convince you that it is both more affordable and will provide higher quality care than our current system. Jason Houk is the publisher of the Rogue Valley Community Press. Mark Kellenbeck is Co-Chair of the Main Street Alliance of Oregon. Wes Brain is a board member of Southern Oregon Jobs with Justice. 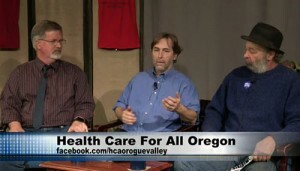 They are all board members of Health Care for All Oregon – Rogue Valley. To view the entire 57 minute program, click here or on the photo shown above. « If we deny health care to undocumented immigrants, can we save money?